There are no comments for Canadian Pacific Train Wreck Graffiti. Click here to post the first comment. 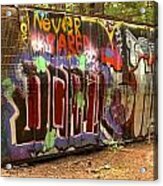 An Old Canadian Pacific Railroad Box Car Covered With Decorative Graffiti Lies In A Forested Area That Has Grown Up All Around The Box Car In The Decades Since The Train Derailed In British Columbia, Canada.